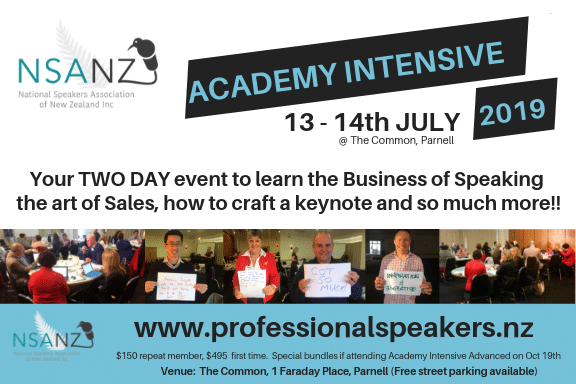 We’re here to help you with our very own Professional Speakers Academy Intensive (AI) – July 13th & 14th 2019. Many of you might have already graduated from the Professional Speakers Academy Intensive (AI), or you might know it as the Professional Development Series (PDS). Irrespective of the name, we believe that we have an excellent program which can help you to build a profitable business. As part of the Global Speakers Federation (GSF), we have been networking with our peers across the world to find out what the best practices are. The Academy Intensive weekend typically is held once a year in Auckland. In order to become an Accredited Member, emerging speakers must complete this weekend as part of their accreditation process. For more experienced speakers, this weekend is the perfect opportunity to refresh and refine what you do in your speaking and training business. We have an amazing line up of speakers for the weekend Academy Intensive in 2019 on July 13th and 14th. You really will want to invest in this opportunity and in your speaking career. Two days of incredible value, covering Keynotes, Sales & Marketing, Finances, Linked In, Social Media, lead generation, workshops and more! This 2-day event is for members at any level and interested guests. The Academy Intensive is an opportunity to workshop with like-minded people with various levels of expertise and is the start of your pathway to becoming an accredited member. If you have previously completed the Academy, we welcome you back at a heavily discounted rate, to hear from amazing speakers over 2 days who will get you reflecting on your business, your goals and your success. There is also the opportunity for AI graduates to attend AI+ in October 2019.